Belle Fourche is a community of 5,600 citizens located on the northern slopes of the world famous Black Hills in western South Dakota. Belle Fourche is a transportation hub within driving distances to Wyoming's well-established oil, gas, and coal fields and to North Dakota's oil production industries. Highway 85, 212, 34; 10 miles from Interstate 90 and served by rail with the Rapid City Pierre and Eastern shortline. in 2014 by Governor Dennis Daugaard. 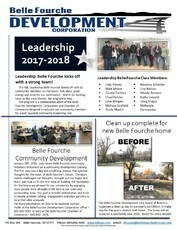 Please contact the Belle Fourche Development Corporation office at 605-892-5065 if you plan to expand or locate your business here.